Deep Fried Turkey, if you haven’t had it, I promise you are missing out on a juicy and well-flavored turkey. It isn’t only people in Texas, home of the fried food exhibit in their State Fair, that enjoy this, you can make these at home. what I really like about this is you can really fry a turkey indoors without an issue. A few years back I tried this at a Blogging convention. I asked the lady doesn’t it make a mess, isn’t it difficult to do while I munched on some of the best turkey I had eaten. She told me I was standing right next to the turkey frying at that moment. Since then I have wanted to try one of these myself. If you go online you can see all sorts of a disaster of people catching everything on fire, and sometimes people actually end up in the emergency room. I can say with this indoor turkey fryer you are going to have great results and this will be simple for you to do. What I really like about frying a turkey is that you can have a turkey cooked completely in about 45 minutes. You can typically fry 2 or 3 turkeys with one batch of oil. I think getting together with a couple of families you can easily knock out several turkeys together. Completely thaw your turkey – thawing a turkey on the countertop is not the best way to thaw a turkey. Consider thawing your turkey either in the refrigerator, it may take a day or two, or you can thaw it in a cold water bath. You can also buy a fresh turkey. When I used to work in the grocery store business you would be surprised how many people would go into the store the morning of Thanksgiving and buy a frozen turkey to prepare that night. Thanksgiving is not a surprise holiday. Buy your bird a couple days in advance. Take the packaging off the turkey – your turkey will come with a variety of packaging. Remove it, remove the leg ties, make sure you remove the plastic pop up cooking tab if available, and make sure you remove the giblets and the neck. You can save the giblets and neck to make broth. Pat the turkey dry – make sure you remove any excess moisture from the turkey. Paper towels will do this very well. Make sure you dry the inside and the outside of the turkey. Excess water may cause the grease to splash and bubble out of control. Cooking the turkey – Preheat the oil to 400 degrees or the proper temperature as mentioned by the manufacturer. The bird will need to cook about 3 to 4 minutes a pound. Cook all dark meat to an internal temperature of 175° F to 180° F, and all white meat to an internal temperature of 165° F to 170° F.
You don’t need to buy an expensive marinade for your deep-fried turkey, you can make one from scratch that is as good if not better than any you can purchase from a bottle. 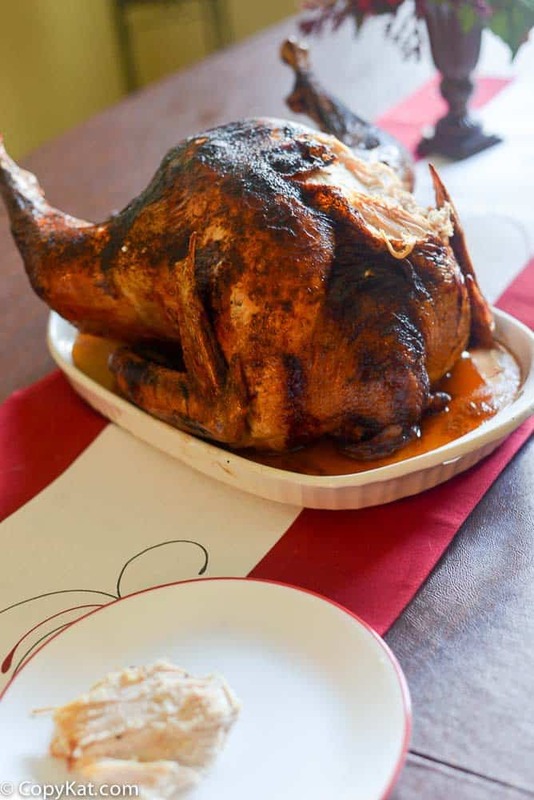 Ideally, you should inject your turkey a few hours before you are going to prepare the bird. Some of my favorites include Lea and Perrins Chicken Marinade this is a simple marinade that can be simply purchased. But you can put together other ones easily. Cajun – you can prepare one with 16 ounces of Italian dressing, 1 cup creole seasoning, 1/4 cup cayenne pepper, and 1/4 cup black pepper. You may also want to use a rub if desired. I like using a simple rub of salt and pepper, it works well to help season the skin of the deep fried turkey. You can use any type of oil to deep fry a turkey. I personally like to use peanut oil, but this is my personal preference. You could also use a blend of vegetable oils if desired. Canola oil works very well to fry a turkey in, and it is a lot less expensive. You haven't had a turkey until you have had it deep fried. Dry bird completely with paper towels. Inject bird with up to 16 ounces of marinade. Allow turkey to marinade in the refrigerator for a couple of hours if desired before frying.Bring oil up to the proper temperature. If desired use a rub on the turkey to help season the skin and the inside of the bird. Fry the bird approximately 3 to 4 minutes per pound.Use a thermometer to make sure that all dark meat to an internal temperature of 175° F to 180° F, and all white meat to an internal temperature of 165° F to 170° F.
I’ve been frying my turkeys this way for the last few years using Alton’s turkey derrick and it turns out incredible every time. I didn’t have any issues, mine worked well the few times I tried it. You’ve convinced me…I’m sending this to my sister, who’s hosting Thanksgiving this year! What is your favorite seasoning on a turkey?